Ziusdra, thanks for commenting! I'm glad you like the deck. 706.11. If an effect refers to a permanent by name, the effect still tracks that permanent even if it changes names or becomes a copy of something else. 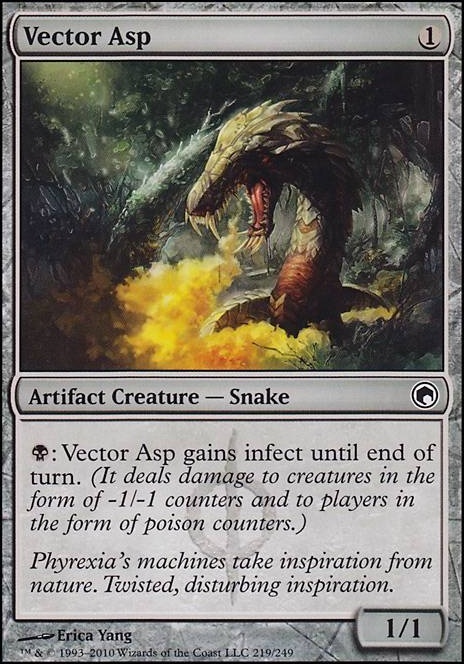 So, when Lazav becomes Vector Asp, he has the ability ":Lazav gains infect until EoT" which means even when he later turns into something else, he still has infect. Second, about the hand cycling. When I built the deck, I tried to make a conscious effort to primarily include selective discard and self-mill. Zephyr Scribe is a good example of this, but expensive mana-wise. Perhaps another looter like Looter il-Kor would be good? 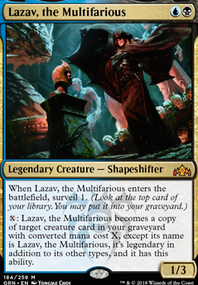 Plus, he has shadow so works from the graveyard for Lazav purposes. Things like Jace's Archivist and Dark Deal force me to discard things I might not want to discard, hence their exclusion. 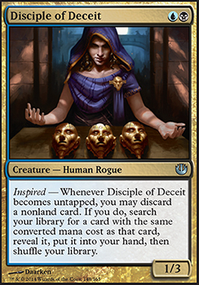 Taigam's Scheming is an excellent card I didn't know exists and I will definitely seek a copy out. It's the exact same as Contingency Plan , actually. As an aside, I do have Windfall in there as a full-hand cycle. One of the great things about this deck though is that even if one of my payloads gets stuck in my hand, I have enough tutor-to-graveyard effects like Entomb , Buried Alive , Final Parting , and Corpse Connoisseur to get other payloads into my graveyard until I find a looter. How is Jace, Vryn's Prodigy Flip useful here as several individual things (Including as a Walker.)? I'm trying to find an Intuition combo w either Phage the Untouchable & 2 other cards, or Vector Asp/Blighted Agent + Phyrexian Dreadnought & one other card. What would you suggest for either? This is actually for a quick wincon, but Myriad effects (Banshee of the Dread Choir for instance.) are considered "Useless" even though I initially thought The Legend Rule allowed multiple Perms of the same name (Creatures & others. ), & Planeswalkers with the same Types. What changed as of Pre-Ravnica Allegence? Don't fret. I'll update the descriptions later. I just have to finish an Okaun, Eye of Chaos + Zndrsplt, Eye of Wisdom Chaos Deck, & update a Melek, Izzet Paragon Storm/Instant & Sorcery Copy Deck. I'll update the descriptions from there; given Ravnica Allegiance has Superfriends Support, Creatureless or not. Blighted Agent Infect wouldn't really work. Vector Asp on the other hand would give the Infect to Lazav. The Myriad effect, either of the Banshee or Blade of Selves would trigger the Legendary Rule which would in turn kill all but 1 of the Lazav's. Vector Asp with Phyrexian Dreadnought would certainly be a 1 hit KO. Add some evasion to it just to make sure.